NYC is Blue: New York Times: Whose Side Are You On? New York Times: Whose Side Are You On? New York sports fans can be a melodramatic lot, but in January one particular group had become agitated on a whole other level. The debut of a newly acquired star player, believed to be set for the season opener in March, had been pushed back at least three months for contract reasons, and they were outraged. Some returned the team jerseys they had bought bearing the player's name. Others vowed to boo him when he did finally arrive. One group of die-hards issued a statement saying it "would like to publicly denounce" the club and the player for the delay. A typical New York fan response to a team's blunder. But here is the difference: The team, New York City Football Club, hadn't played a game yet. Not just this season. Ever. "It's a very good sign," said Tom Glick, N.Y.C.F.C. 's president, "to have this level of passion at this point in our development." Mr. Glick may be making lemonade out of lemons, but he has good reason to be optimistic. 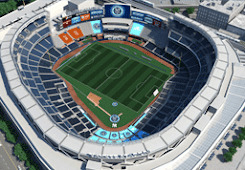 New York City F.C., an expansion club in Major League Soccer, will play its first regular-season match on March 8 and its first home match, at Yankee Stadium, on March 15. It has already sold 14,000 season tickets, Mr. Glick said, and has a fan base rabid enough to get extravagantly upset over things that haven't happened yet. "New York City has been starved for an M.L.S. 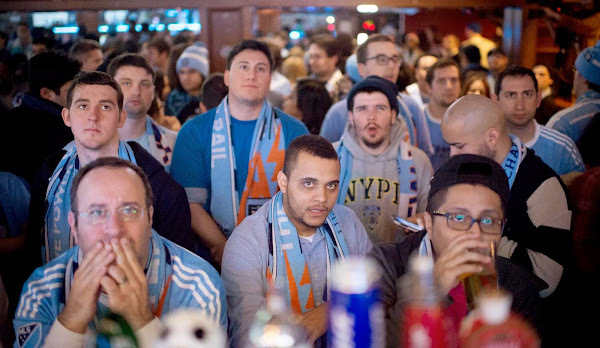 team for so long," said Brian Toto of the Third Rail, an independent N.Y.C.F.C. fan group whose more than 1,600 members paid $30 each to join. "Now we finally have one." The New York Red Bulls have been playing in the metropolitan area for 20 years, starting as the New York/New Jersey MetroStars in the Meadowlands before changing names and, in 2010, moving to a $200 million soccer stadium in Harrison, N.J. But the league and N.Y.C.F.C. and its fans believe there is room for another team, in the city itself. "We're excited to have another M.L.S. team in the area," said Joseph Stetson, a Red Bulls vice president. "It'll help to raise awareness and coverage of M.L.S. soccer in the area." Of course, both teams claim to represent New Yorkers, and for Red Bulls fans who live in Upper Manhattan, say, or the Bronx, there's a real decision to be made. This is not the first time that New Yorkers have faced such options — in all the big sports, freshly minted teams have forced fans to choose between the brash new and the established old. In 1960, the New York Titans, soon to be renamed the Jets, arrived to challenge the football Giants. Two years later, the Mets were born to replace the departed baseball Giants and Dodgers and challenge Yankee hegemony. The Nets began as the New Jersey Americans in 1967, then moved to Long Island, back to New Jersey and finally to Brooklyn, as an increasingly viable alternative to the Knicks. The Rangers' fan base has withstood incursions from the Islanders on its east flank and the Devils on its west. "I know New York," the senatorial candidate Kenneth Keating said in 1958, according to Jimmy Breslin's account of the bungling early Mets, "Can't Anybody Here Play This Game?" "It is not used to having a single loyalty to a single team. This is a city which must have divided interests." "N-Y-C! N-Y-C! We are N-Y-C F-C/ From the Bronx all the way down to the Battery! We are N-Y-C F-C!" Mr. Toto, Third Rail's "vice president for fan experience," was among those on hand. He cited the "three strikes" that N.Y.C.F.C. had already accumulated in the eyes of some of its fans. The first was the delayed arrival of the star player, Frank Lampard, who opted to stay with Manchester City until the end of the English season in May. The same conglomerate based in Abu Dhabi that owns Manchester City owns N.Y.C.F.C. "They said we weren't going to be Manchester City B," Mr. Toto said, before launching into a discussion of N.Y.C.F.C. 's light blue shirts, a dead ringer for the Manchester City uniform. "Then the jersey comes out, and it's like, O.K., are we Manchester City? What's going on? They were going to use the New York City colors" — the dark blue, orange and white of the municipal flag — "and then they throw sky blue in." Mr. Toto was interrupted before he got to the third strike. More fans were arriving — a multicultural crowd, mostly male but with many women mixed in. It was a good urban blend that nonetheless reflected two striking demographic traits: Almost everyone was in their 20s or 30s, and almost everyone lived in the five boroughs. The crowd's makeup was in line with the club's own statistics for season-ticket buyers: Most are young professionals who live in the city, and 63 percent have never before owned a season ticket for any team in any sport. "I grew up in Kansas City and was a fan of the Wizards, the M.L.S. team there," said Caleb-Michael Files, 23, who was decked out in N.Y.C.F.C. and Third Rail gear. "When I moved to New York, I had to find a family, so here I am." "I was born in Queens, moved to the Bronx, spent my whole life in New York City," said Andy Bajaña, 19, who was clad in sky blue. "I was a MetroStars fan growing up, then they became the Red Bulls. To me, that was disrespectful. We've got the best city in the world — we're going to sell out to an energy drink company?" Glass houses, as the expression goes. Yes, the Red Bulls are owned by the giant Austrian energy drink and sports company, but N.Y.C.F.C., which paid a $100 million expansion fee to join the league, is no mom-and-pop outfit. Eighty percent of N.Y.C.F.C. is owned by City Football Group, the Emirati conglomerate that in addition to Manchester City, one of the most free-spending clubs in the world, also owns teams in Australia and Japan. The Yankees own the balance. And if anyone is still unclear about whether big money is behind N.Y.C.F.C., the team's shirt sponsor is Etihad Airways, a flag carrier of the United Arab Emirates. Still, in New York, tribes will be tribes. "Dodger fans could not bring themselves to be Yankee fans, they really couldn't do it," said the author Pete Hamill, recalling New York's baseball scene between 1958 and '62. He remembered his father's emotional journey in those dark years after the Dodgers and the Giants had abandoned Brooklyn. "He was just waiting for the opportunity to root for something, and he couldn't do it with the Yankees," he said. "He became a Met fan, I think when they were in that first spring training. It was, 'Our tribe is not going to root for the Yankee tribe.' "
Red Bulls game in 2007. New York's first big-money soccer team was the original Cosmos of Pelé and Franz Beckenbauer. They had their heyday in the late 1970s and early '80s, playing before capacity crowds of 77,000 at Giants Stadium in the Meadowlands, with Mick Jagger and Henry Kissinger watching from V.I.P. suites. But the team and the league collapsed in 1985, starting a long, fallow period for professional soccer in the area. Slowly and steadily, however, the sport has come back, spurred by easy access to telecasts of overseas leagues, the spread of computer games, explosive interest in the World Cup and a recent proliferation of playing fields and adult recreational leagues. According to Nielsen, soccer's audience is young, like the N.B.A. 's, not old, like Major League Baseball's. "It's really amazing to see where the sport was, and where it is today," said Claudio Reyna, who watched the Cosmos as a little boy before growing up to play for the United States national team, Manchester City and the Red Bulls. Today, he is N.Y.C.F.C. 's director of football. "There was a time when the sport didn't really exist in the New York area. Now there's inspiration right here in our backyard, and wave after wave of growth in the coming years." Even the Cosmos have come back; the team now plays in the second division of soccer in the United States in a stadium at Hofstra University on Long Island. Given all that, what is occurring with N.Y.C.F.C. 's formation represents a stunning confluence of soccer's growing popularity, the power of the Internet and the desire among many of the city's millennials to create a fan culture like those they have seen in Europe, Latin America and, increasingly, the United States. 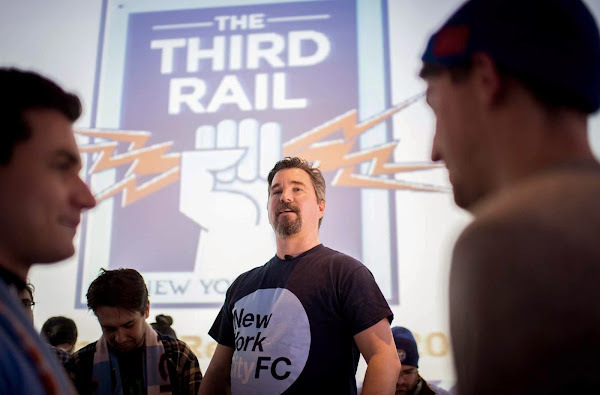 Chance Michaels, the Third Rail president and, at 43, one of its oldest members, sees the N.Y.C.F.C.-Red Bulls divide on a much grander scale than a mere duel between corporations. For him, it is the embodiment of a cultural struggle between city and suburbs, not just as reflected in the trajectory of American soccer, but in American society itself. "In the beginning, the MetroStars, and later the Red Bulls, really seemed to have staked out the suburbs, particularly the Jersey suburbs, as their real market," he said. "That was part of the era we were in — you know, the soccer moms, that big political demographic in the '90s and early 2000s. They thought that the suburbs were the future of the sport." But since 2002 the M.L.S. has doubled in size and has found a new vibrancy in urban stadiums, like those in Seattle and Portland, where singing, chanting fans display an enthusiasm as unbridled as any in American sport. To Mr. Michaels, however, the Red Bulls are part of the old, suburban paradigm. "They didn't seem to have a ton of interest in the city itself," he said. "And, to be honest, I think the city kind of returned that lack of interest. And so the Red Bulls were never really able to capture the market here." That point is disputed by Red Bulls fans. "We have people from all over New York," said Jen Muller of the Empire Supporters Club, one of the three independent Red Bulls fan groups. "We're pretty much split down the middle between people from New Jersey and from New York, and we haven't lost that many people to N.Y.C.F.C." According to estimates, about 40 percent of those who attend Red Bulls games at the team's five-year-old stadium in New Jersey come from New York City. James Cureton, 30, from Marble Hill, where Upper Manhattan meets the Bronx, is one. "It's like a family-type thing," said Mr. Cureton, who sometimes spends two and a half hours getting to Harrison. "I don't see N.Y.C.F.C. as something I necessarily identify with, just because they slapped that name on the team. I don't feel it represents me. I think the Empire Supporters Club represents me as a person, and I wouldn't give that up for something that might be just 15 minutes away from my home." With soccer fans identifying so tribally, and fan groups like Third Rail and Empire paying handsomely for "tifo" (enormous, unofficial banners displayed in the stands as teams enter the field), it is easy to see where this could all be headed. The league would like nothing more than a frothy, regular "subway series" between the Red Bulls and N.Y.C.F.C. Such a derby, as intracity matches are known throughout the soccer world, can electrify a team's supporters. Although many of the greatest derbies — in Buenos Aires, Glasgow, Istanbul — tend to incite a level of fandom that the league, and stadium security, would probably prefer to avoid. Rivalries among New York teams usually do not have sectarian roots. They may be defined along geographic lines, like Rangers-Devils or Rangers-Islanders in hockey. Perhaps Red Bulls-N.Y.C.F.C. will look more like the rivalry between the Nets of hip-hop, hipster Brooklyn and the Knicks of older, more established and, perhaps, squarer Manhattan. In any case, the teams will face each other May 10 and Aug. 9 at Red Bull Arena, and on June 28 at Yankee Stadium. Both sets of fans are playing down any talk of rivalry — for the moment. "We'll see if something develops between N.Y.C. 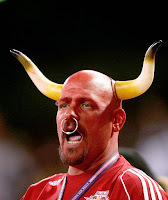 and the Red Bulls, but right now, I don't hate the Red Bulls," Mr. Toto said. "I can't hate them — we haven't even played them yet." 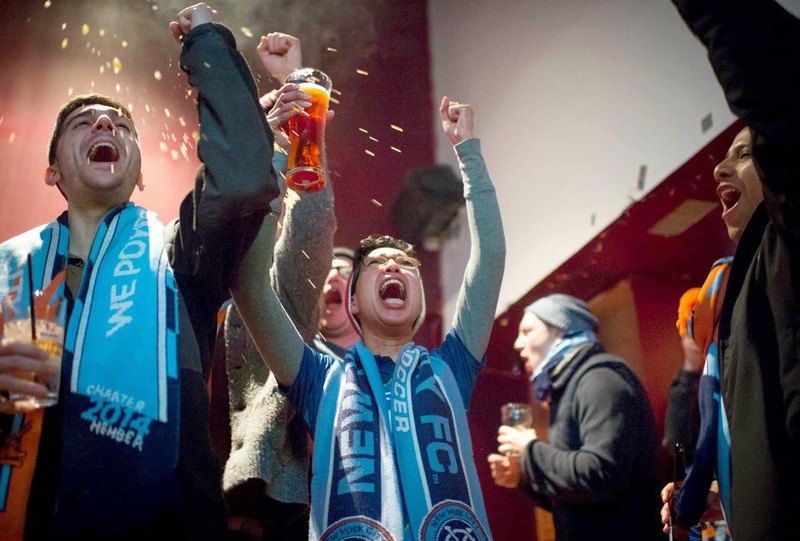 This year, New York soccer fans will have two M.L.S. teams to choose from. 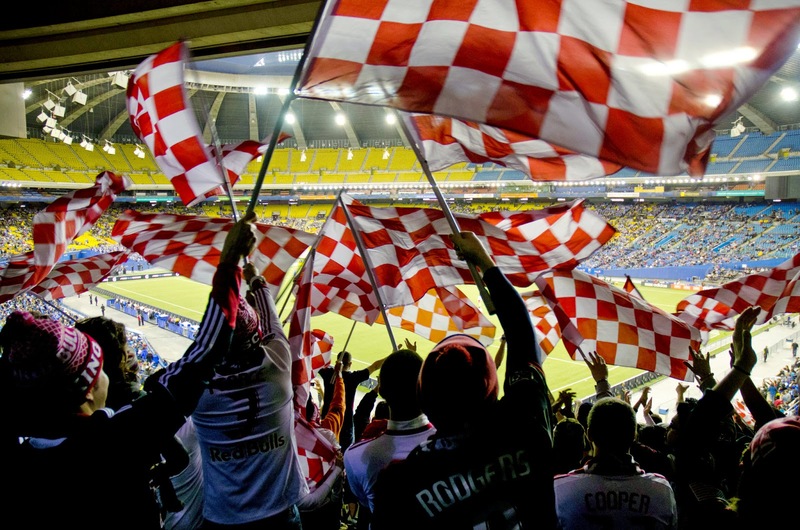 Here, a rough checklist to determine whether you’re a Red Bulls fan or a City supporter. Five or more checks in either column chooses your side. Wall Street Journal: "At Long Last"